Santorini ferry port lies on the southernmost of the Cyclades islands, in the Aegean Sea about 63 miles from Crete. The total area is about 74 Sq. Kms. The Cyclades Islands in Greece are a gorgeous collection of unique and beautiful islands. The southernmost area in this island collection is Santorini (also officially known as Thira). 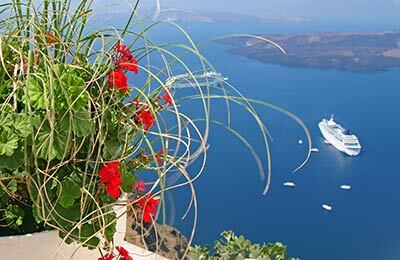 The port of Santorini has many routes linking to fellow islands in The Cyclades, as well as Crete and mainland Greece. The routes are operated by Blue Star Ferries, LANE Lines, Zante Ferries and Aegean Speed Lines. You can find the best ferry for you using the simple booking form from AFerry. Below, you can find Santorini ferry times, as well as our best deals. LANE Lines fleet consists of two cruise ships Ierapetra L and Vitsentzos Kornaros equipped with all the modern facilities such as air conditioning throughout, a la carte and self service restaurants, bar and cafe, a disco, television and video facilities, a bar on the open deck, a gift shop and a tourist information centre along with a number of comfortable cabins and seating accommodation. Santorini ferry port lies on the southernmost of the Cyclades islands, in the Aegean Sea about 63 miles from Crete. The total area is about 74 Sq. Kms. 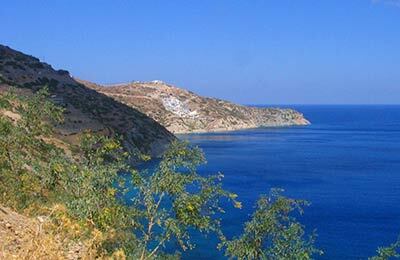 The Cyclades Islands in Greece are a gorgeous collection of unique and beautiful islands. The southernmost area in this island collection is Santorini (also officially known as Thira). Ferries from Santorini go to Crete and Greece and can be booked online through AFerry. You should find all the facilities you need within walking distance of Santorini ferry port.